Next week sees the release of Ron Fricke’s Samsara / Baraka Box set - two astounding films that show the beauty and the tragedy of our times. Both these films are captivatingly shot as Director Ron Fricke and Producer Mark Magidson and their team travel the world, 152 locations in 23 countries for Baraka alone, capturing poignant moments of everyday life, nature and technology and pulling them together in a compelling and powerful non verbal narrative tale of the beauty and destruction around us. To commemorate the box set release we are offering two readers the chance to win a copy of the recently restored Baraka on Blu-ray. Next to 4K big screen cinema, Blu-ray is the best format to see these astounding films in – the cinematography really needs to appreciated in proper high definition - Baraka was the first film in over twenty years to be shot in the 70mm Todd-AO format and the first movie ever transferred in 8k Ultradigital HD. In the same vein as the classic eye opening Qatsi trilogy (Koyaanisqatsi: Life Out of Balance, Powaqqatsi and Naqoyqatsi) which both Ron Fricke and Mark Magidson worked on before teaming up to create Chronos, Baraka and last year’s marvellous Samsara. Shot in breathtaking 70mm in 24 countries on six continents, Baraka is a transcendent global tour that explores the sights and sounds of the human condition like nothing you have ever seen or felt before. These are the wonders of a world without words, viewed through man and nature s own prisms of symmetry, savagery, harmony and chaos. Baraka is an ancient Sufi word, which can be translated as "a blessing, or as the breath, or essence of life from which the evolutionary process unfolds." BARAKA produced by Mark Magidson and directed and photographed by Ron Fricke, award-winning cinematographer of KOYAANISQATSI and creators of the IMAX® sensation CHRONOS has now been fully restored from its original camera negative via state-of-the-art 8K UltraDigital mastering to create the most visually stunning Blu-ray ever made. The incredible true story of how a crew of 5 and several tons of 70mm camera equipment traveled to 24 countries over 14 months, all to capture one extraordinary vision. It's an in-depth documentary saga of the happy accidents, near-death experiences and astonishing images that would create [one] of the most acclaimed movie experiences in history, featuring revealing interviews with director/cinematographer/editor/concept Ron Frike, producer/editor/concept Mark Magidson, musical director/composer Michael Stearns, supervising producer Alton Walpole, vocalist Lisa Gerrart of Dead Can Dance, and much more. Discover the unprecedented technical challenges and achievements that went into the restoration of the original 65mm negative and frame-by-frame digital scanning to create what may be the most stunning high definition DVD of our time. 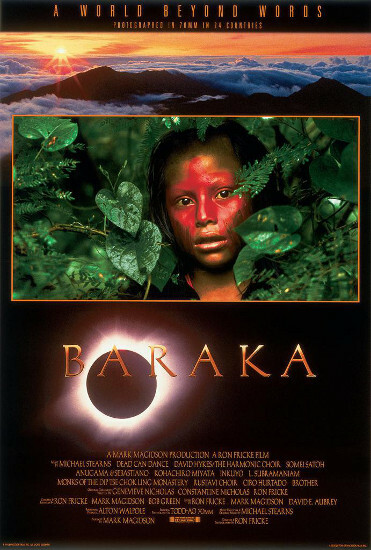 Now 20 years after its original release Baraka has been widely hailed as a classic that even now continues to find new audiences. It has won numerous awards, including the FIPRESCI (International Critics) Award for Best Picture at its initial release at the Montreal Film Festival in 1992. Samsara subverts our expectations of a traditional documentary. It encourages our own interpretations, inspired by breathtaking images that infuse the ancient with the modern and set against a mesmerizing musical score featuring the work of Lisa Gerrard, Michael Stearns and Marcello De Francisci. For the chance to win a Baraka Blu-ray all you have to do is head over to The Establishing Shot’s Facebook page and hit the Like button. If you have liked our page prior to this competition just drop us a comment on our Facebook page saying "I would like to see Baraka" to be entered and if you are a winner we will contact you for your contact details of where to send your Baraka Blu-ray.